Dubai, UAE, January 05, 2019: SteelFab 2019, the region’s premier metal working event, will witness the participation of a number of leading countries in the fields of welding and manufacturing of steel and metal. These countries will participate through national pavilions that comprise some of the largest commercial and manufacturing companies in the world. The mega-event will be hosted at Expo Centre Sharjah during January 14-17. Steelfab, which will hold its activities across 6 halls at Expo Centre Sharjah, will host a new national pavilion representing the United Kingdom for the first time. The new pavilion will include the participation of 6 of the largest British manufacturing companies. 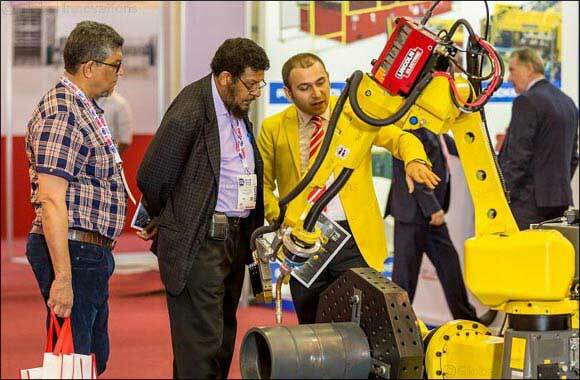 The 15th edition of the exhibition will also host a number of national pavilions from prominent countries in the field such as Italy, India, China, Taiwan and Turkey, in addition to the global Essen Welding and Cutting Pavilion, which will participate in the event for the second time in a row and will include 13 German companies. SteelFab, which will include the participation of a number of Emirati companies, will be held in conjunction with the Fasteners World Middle East Exhibition, the region’s only specialist fastening and fixing exhibition for design engineers, production professionals, manufacturers and fastener buyers. HE Saif Mohammed Al Midfa, CEO of Expo Centre Sharjah, stated that the number of national pavilions increases year by year, and that the last edition of the exhibition featured the addition of a German pavilion, as part of the framework of the cooperation agreement signed between Expo Centre Sharjah and the German Messe Essen exhibition centre. He added that this upcoming edition will feature the addition of a national pavilion representing the United Kingdom, which enhances the leading status of the event and highlights its importance both locally and regionally. Al Midfa remarked that the participation of the German “Schweissen and Schneiden” exhibition, which is a European meeting place for experts and top decision makers of the joining, cutting and surfacing technology industry; in addition to a number of British companies and a group of national pavilions that are considered leaders in the metal working field, will provide added value to the event, as well as a wider variety of the latest products and advanced solutions, and will enhance the level of competition between exhibitors in attracting dealers and potential partners from various markets in the region.